1. Where do rumors come from and how are they created? 2. Why does the CCP government so madly suppress and brutally persecute Almighty God and The Church of Almighty God? 3. Why does the religious world put so much effort into condemning and madly resist Almighty God and The Church of Almighty God? 6. What really is the evil essence of the CCP government and the religious world? 9. What is the nature of the issue of believing the rumors of the CCP government and the religious world? 10. How does God treat those who believe Satan’s rumors and turn their backs on Him? 14. What will the outcome of the CCP government and the religious world be after they madly condemn and resist God? Some people listen to so many of God’s words, yet when they listen to one sentence of the great red dragon’s negative propaganda, they start to be suspicious all of a sudden. It is as if God’s words are not true and the work that God does is false. Do these kinds of people have faith in God? This is not faith. The faith of Abraham and Job was genuine faith. They harbored no notions no matter what God said. What were the most important words that Peter spoke in his testimony? “Even if God were playing with humans like they were toys, how would humans be able to complain? What right would they have?” Did these words spoken by him show genuine faith? (Yes.) Some people say, “I will always obey, no matter what God does. The lies spread by the great red dragon amount to nothing! Even if all the things that the entire religious world and the great red dragon say were true, I would still believe in Almighty God.” Does this show a genuine faith? Only this shows a genuine faith. Why do you believe in this manner? Because you can see that God is real, you can see that the things that God says are true, and you can see God is doing the work of perfecting man. This is why, no matter what the great red dragon says, even if what it says were true, God would still be God, and God will forever be God! Someone says, “Now, is it the case that no matter what God does, He is still God?” Correct. This is how it is. Let’s say you have two children. With one word, God causes your two children to die. Is He still God? Would you still believe? If God lets your entire family perish in an earthquake, would you still believe? (Yes.) Why would you still believe? Because this does not affect God’s essence and the reality that God is still God. God is God. No matter how many things God does that are at odds with man’s notions and no matter how many destructive things He visits upon mankind, He is still God. Isn’t this a genuine knowledge of God? (Yes.) No matter how many good things Satan does, it is still Satan, right? Someone says, “Then how do you tell the positive from the negative?” What are positive things and what are negative things? What is correct, and what is wrong? What is true and what is false? How do we differentiate these things? Everything God says is the truth and is positive, because God is the truth. All the things that Satan says and does are evil, wicked and fallacious. They are all negative things. It is fine if you define these things in this way. No matter how many things Satan does that people think are good, it is still Satan. No matter how many things God does that destroy and punish mankind, He is still God. It is an objective fact. For example, regardless of how your father beats and scolds you, he is still your father. If he treats you well, he is your father. If he does not treat you well, he is still your father. No matter how he treats you, he is your father. Why do I say this? It is a fact that he is your father. If it is an established fact that he is your father, then nothing that he does can cause this fact to be untrue. This is the correct way to see things. Someone says, “Of the things that God does, there are some matters in which I do not see how it could be the truth, nor do I see how they could be beneficial to mankind.” In this case, you must seek the truth, listen to fellowship and sermons, and read and ponder more of God’s word. As for the key aspects which cannot be clearly explained by man, pray to God about them and perhaps the Holy Spirit will enlighten you, and then you will be able to understand a bit more. One day, you will know that whatever comes from God and everything that God does or says is the truth, and all of it is positive. Is this a good way to experience God’s work? (Yes.) If you always try to delimit God, you will never be able to know God. Once you learn how to obey God, you will be able to know God. This is the secret to obtaining the truth! Some people say, “How many years do I have to pursue the truth in order to attain an understanding of God? I have yet to attain the truth, so what should I do when I encounter the tricks and rumors of Satan?” Is this problem easy to tackle? Let me tell you the truth. If you firmly believe that Almighty God is the incarnate God and that He has begun to utter His words and has appeared to perform His work, then no matter what Satan says, first of all, do not listen. Say no to Satan. Secondly, you say, “Even if what you say is all true, I cannot deny God. I will still accept God’s work.” This is true faith. Why do I say this? Don’t regard this statement as very ordinary, for it has a deep meaning to it! “I suppose, even if what Satan says is true, Almighty God is still God. He is still God appearing and performing His work. Why wouldn’t I accept Him? Even if what the devil Satan says is true, it cannot be denied that He is the incarnate God and that this is God’s judgment work in the last days.” … If you’re really certain that He is the true God, you won’t doubt God no matter what Satan says. Is the incarnation of God just a hearsay to you? Is the truth expressed by God just a lie to you? All of this is true. Could you write the truths expressed by God? Who else could possibly write them? Could anyone in the religious world speak these truths? No human being could speak these truths, let alone the great red dragon. The incarnation of God is real. The Word appearing in the flesh is real. The truth expressed by God is real. The judgment work of God in the last days is real. Millions of people are experiencing it right now! Even if the rumors made up by Satan were true, could you still deny the fact of God’s work or the truth expressed by God incarnate? No, you couldn’t. What Satan says has nothing to do with God at all, nor does it have anything to do with God’s work. They are totally unrelated and are poles apart from each other. How should people face the fallacies, deceptions and lies of Satan? First, deny them, reject them, and say no to Satan. Second, whether its lies are consistent with your notions and imaginings or not, they have nothing to do with the appearance, work and incarnation of God. There is no contradiction at all. Why do some people deny God and give up their belief after listening to Satan’s lies? They deny God incarnate, the truth expressed by God, and the judgment work of God in the last days because Satan tells one lie. Someone says, “It is because God is such-and-such, so I don’t believe in Him. No matter how real, how practical and good the things that He accomplishes and the truth He expresses are, I still don’t believe.” Isn’t this person absurd? This person is too absurd. Today, there are many people whose notions are absurd! Would you believe them if someone fabricated some lies and rumors about me? Whether or not you believe them depends on whether or not you possess discernment. Remember this: All that nonbelievers, the great red dragon, and the religious world say about God and the man used by the Holy Spirit is incorrect. It is all rumors, lies, distorted facts, framing and false charges. This is because they are nonbelievers and are of demons. They are not God. You must be certain of this first. Whose words are most credible? God’s words are most credible. In addition, the words of the man used by the Holy Spirit are also credible. What he tells you is all true. He does not distort the facts. He speaks according to the reality of the truth and he takes responsibility for people in what he says. So no matter what you are dealing with, you must have the truth. If you do not have the truth, then you can only rely on your notions and that little bit of normal sense that you have to make a judgment, and this is not appropriate. When temptations come, you will not be able to stand firm. You must be able to thoroughly understand many real matters. If you can only speak letters and doctrines, then as soon as you face a real matter, you will get confused. Such people do not have the reality of the truth. Without the reality of the truth, when faced with many issues and confronted with the rumors of the great red dragon and the lies of the religious world, if you are not able to thoroughly understand these things, then you will become dispirited, you will doubt God, develop notions about Him, and deny Him. What does this illustrate? If you do not have the truth, then you cannot see things clearly. What problem needs to be resolved before you can know if a statement is true or false? You need to first see whose mouth this statement came from. This is very important, and you have to grasp this principle. Can good words come out of the great red dragon’s mouth? Can it speak true words? It cannot possibly speak true words. Can true words come from the mouths of the pastors of the religious world? This is not possible, either, because the pastors of the religious world do not know God. Since they do not know God, can good words come from their mouths? Can good words come from the mouths of nonbelievers? No, they cannot. So from whose mouth do reliable words come? (God’s.) The words that come from God’s mouth are the truth, and the words that come from the mouths of those who have the truth are reality. Those are true words and are in line with the facts. Have you grasped this principle? What must you understand first whenever you hear something? You must understand whose mouth it comes from. If the words come from Satan, the great red dragon or from religious people, then they are one hundred percent certain to be lies, rumors, framing, false charges, defamatory words and false accusations! If they are spoken from the mouths of people who understand the truth, then they are true, honest and highly credible. 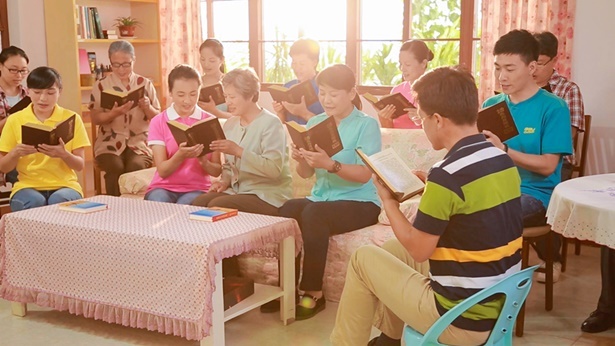 If they are revealed from the mouth of God incarnate, then no matter whether you comprehend them or not, understand them or not and acknowledge them or not, these words are all the truth. If you do not acknowledge these words to be the truth today, then you must sooner or later acknowledge that they are the truth. If the great red dragon says more things and discredits The Church of Almighty God, what should you do? You say: “These words come from the mouth of the great red dragon. They are lies and rumors! This is a sure thing!” If they are words uttered by God, but you don’t quite understand them from their literal meaning, when you see they are uttered by Christ, you should be able to say: “Without a shadow of doubt, this is the truth! Though I may not understand or comprehend it today, it is the truth.” Or you should say, “Today these words are at odds with my notions, but they are still the truth. Sooner or later I must recognize that this is the truth, and this is undeniable.” Can you treat the word of God like this? If you can uphold this principle, you will be able to stand firm. If you cannot uphold this principle, you will easily fall down. ... A lot of things happen to reveal people! If people do not have the reality of the truth, it is so easy for them to be taken in and deceived. There are some things that God will not tell you and the man used by the Holy Spirit will not tell you either, and moreover there is not an appropriate environment to tell you, so what should you do? What should you rely on to resolve your problems? (The truth.) Correct. If you do not have the truth then you cannot thoroughly understand things. For example, if someone says that your husband has had sexual relations with another person or that your husband has stolen money from people, or that your husband has committed a crime, how would you judge if this is true or false? What would your first reaction be? “Is my husband that kind of person? Could my husband do this kind of thing?” You must base your judgment on your understanding and knowledge of your husband. If you do not understand or know your husband, and you have only just got together, then you will not be confident enough to say if the accusations are true or false. If you have lived with your husband for many years and you understand him very well, then you can easily judge whether the accusations are true or false. Here, understanding is the most important thing. If Satan makes up some rumors and lies about God, what should you base your judgment on? The most accurate way is to base your judgment on your knowledge and understanding of God. Because at that time, God cannot see you and you cannot get definitive words from God. If you do not truly know God, then this will be really troublesome for you and it may reveal you and even weed you out. Therefore, people will face many issues in the future. The critical thing as to whether or not people can stand firm is whether or not they have the truth. If you do not have the truth, then when you face many of Satan’s temptations, you will not have a path to tread and you will feel doubt in your heart, notions will arise in you, you will be shaken and you will make some wrong judgments and choices and may even be ruined. This is such a critical issue! Next：What will the outcome of the CCP government and the religious world be after they madly condemn and resist God?